Technology is our business. But, it's not what keeps our customers coming back. Because, the thing is, you can have the latest and greatest technology, but if you don't have good people backing it up, you won't get the best return on your investment. Good people take the time to get to know your needs and make sure you get the right products for your business. They don't oversell or undersell. Good people also make implementing your new technology as easy as possible by managing all of the details. And good people are there long after your technology is installed. So we make it our priority to hire the best and brightest. And then invest in their skills on an annual basis. Over half of our employees are certified systems engineers and technicians who are certified at the highest level for their area of expertise. But that's just part of the equation. We're also expert listeners and problem solvers. Because if we can't determine what you need, all that training won't make much of an impact. Finally, we're led by an experienced and respected leadership team with a tenure ranging from one to more than four decades. Because the best cultures are created from the top down. Since taking the helm at Marco, Jeff has led the company through aggressive growth and opportunities. He has transformed what started as a small typewriter dealer in 1973 into a rapidly growing technology company with offices throughout the Midwest. He believes in high performance, sustaining a fun workplace and keeping score. Steve is a highly respected sales veteran in the technology industry and a coveted speaker on many topics, such as production print solutions, sales growth and effectively expanding client relationships. 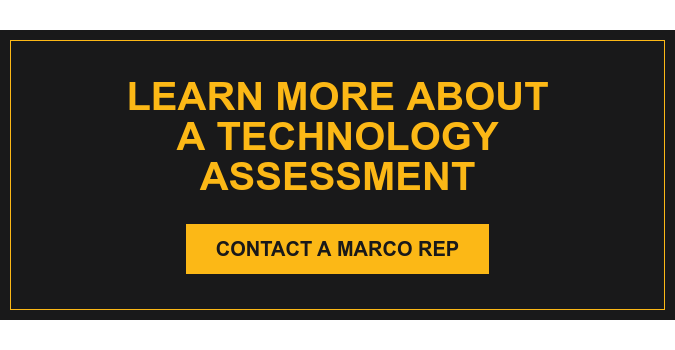 His keen sense of humor and infectious personality help drive Marco’s sales professionals to perform at their very best. Steve always wanted to be an astronaut when he grew up—or better yet, the CIO/CTO of Marco. His down-to-earth personality and “no geek speak” philosophy make him a sought-after speaker on “all things IT” nationwide. The book of Jennifer’s life would be titled Small Town Girl. This central Minnesotan girl turned business executive by using her distinct combination of analytical and communication skills to promote organizational growth and productivity. As Executive Vice President of Business Development and Operations at Marco, Jennifer is inspired by helping solve other people’s challenges and contributing to their ultimate success. Chris joined Marco's team as the chief financial officer in 2017. He came to Marco with a long list of accomplishments and a host of experiences, including investment banking, public accounting and multiple senior financial leadership roles. If Scott could trade places with anyone for a week, he would choose Bruce Springsteen. Even though fans don’t scream for him daily, Scott is popular at Marco for his genuine, sincere personality and passion for continuous improvement. Todd joined Marco's team in January 2016 as Director of Sales and was promoted to Vice President of IT Solutions. Patty has over 30 years of experience in advertising and marketing. She joined Marco in 1987 and has held various marketing positions within the company over the years. She was appointed Marketing Manager in 2014, Director of Marketing in 2015 and Vice President of Marketing in 2018.